Preparing for divorce with a prenup before you even get married sounds like a great way to kill the romance, right? Marriage is often painted as a romantic joining. While that is true, marriage is also a legally binding partnership, and given current divorce rates, it is often pragmatic to protect each side in case the romantic partnership later dissolves. A couple might want a prenup if one or both individuals have many assets or want to provide for children from previous relationships. 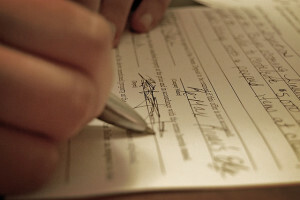 Creating a prenuptial agreement offers an opportunity to avoid bitter disputes and the cost associated with property distribution. DO consult an attorney. While some couples prefer to draw up their own agreement, it really is best to have an attorney review the language to make sure it is enforceable. DON’T wait until the last minute to discuss the idea or to create the agreement. Discuss the options of a prenup as soon as possible. As the wedding date draws near, it creates a looming deadline. The related pressure may force one or both parties to sign something they don’t feel comfortable with. Later, he or she might say it was signed under duress, which could make the agreement invalid. DO calmly discuss the issues, setting aside emotion as much as possible. Include all property, debts, and alimony. Consider not only your children but any business partners who might be affected by your separation. While a prenuptial agreement isn’t romantic, discussing each person’s finances and getting these issues out in advance may improve your chances of remaining married. Smith Debnam Law, one of the many law firms who are advocates for the Second Saturday Wake County divorce workshop, provided some of the information in this post.